I’ve wanted to cover at least one of the Pretty Cure shows in the franchise on this blog but many outside factors have prevented from happening. Luckily a kind soul who is far better at time management than I am succeeded in doing just that. 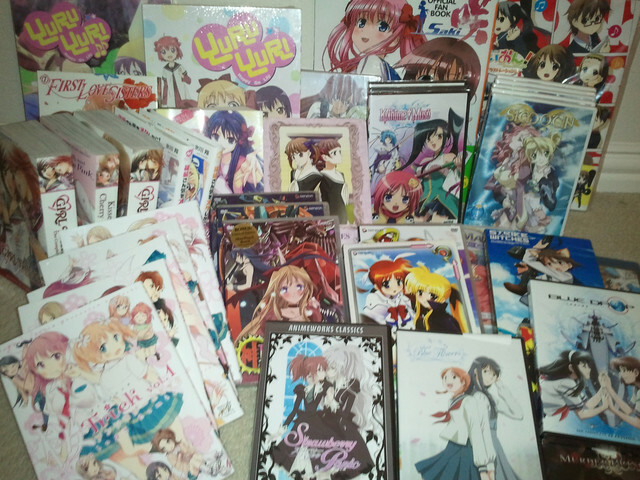 Here is one of the more “invisible” yuri nation members, Mr Rory from Rory Muses, with a quick look at every single entry in the PreCure franchise up to the 2015 one, “Go! Princess PreCure”. Basically this qualifies as a “Yuri Quickie” for PreCure. For everyone wondering, most of the PreCure franchise could be considered Grade 3. Gradually, I have been watching each season of Pretty Cure. Since each one is around 48 episodes long, this is something that has taken quite some time. It certainly doesn’t help when there is a series that I don’t enjoy too much, but I’ll get into that in a moment. Rather than review each season of Pretty Cure, I figured I would just collect together my thoughts here and share them with the readers of this blog. I’ll go through each season in chronological order, grouping together the seasons with direct sequels. After I’ve shared my thoughts on all of them, I’ll list each season from worst to best, in my opinion. I should mention that Go! Princess PreCure won’t be on this list, as it it still currently airing at the time of writing. This entry was posted in Yuri Quickie and tagged Pretty Cure, Yuri. Bookmark the permalink. Better at time management? Nah, I’ve just got far too much free time on my hands – though it did take the best part of a year or more to cover all of it. Regardless, thanks for reblogging this and I’m happy that I was able to contribute to the nation. Whatever the case your contribution is most appreciated. I’s seen much of Season 1, and I find it quite enjoyable. Sadly it seems only season 1 has a Dub. Shame but these shows are meant to be watched subbed anyway. Really, They have Subtitles even when they air in Japan? Anime is a visual medium, having to read while watching needlessly complicates things. I was referring to the characters speaking Japanese. If you can understand Japanese then you’re good to go. Guess I have to pick it up..or any PreCure at some point. I also like Doki Doki as well and it is my second favorite Precure season after Heartcatch. Go Princess is also a contender for number one. I also don’t understand why all the hate for Doki Doki and the praises for Happiness Charge when its clear as day that Doki Doki is a lot better than Happiness Charge in terms of characters and story. But I guess its one person’s interests so to each their own. Probably based on what I heard is because Mana is seen as John Cena to haters or something like that. i have also watched all precure up to happinesscharge (didn’t finish, felt i was watching yes!precure again). agree with most of the rankings though I rate SS and Futari wa the same and suite is just below Doki Doki for me. I loved the hibikana moments, would be so much better if the didn’t introduce muse, or the other attack items since their first one was just the two of them and so well put together. Surprisingly, the mascots can make a difference in how the show gets rated (besides the subtext of course). Fresh Precure probably wouldn’t be so high up for me if it wasn’t for Tarte (and a much better opening than splash star) just like the three in Yes!Precure just completely ruins any hope for a higher ranking. Mana is the queen and Doki Doki is definitely the best. I’ve only been watching the series since Smile (2012), but the reviews seem accurate and to the point. If I had to recommend that you watch one season as a whole, it would be Doki Doki as well. Good to know it’s popular among yuri fandom. I am currently enjoying Go! Princess Precure for its well-plotted storyline and yuri subtexts. Also kind of interested in how they are going to do with the Smile Precure dub.